Honor 7x is available on Amazon.in at a starting price of Rs12,999 for the 4GB RAM+32GB storage variant, while the variant with 4GB RAM and 64GB storage will cost Rs15,999. 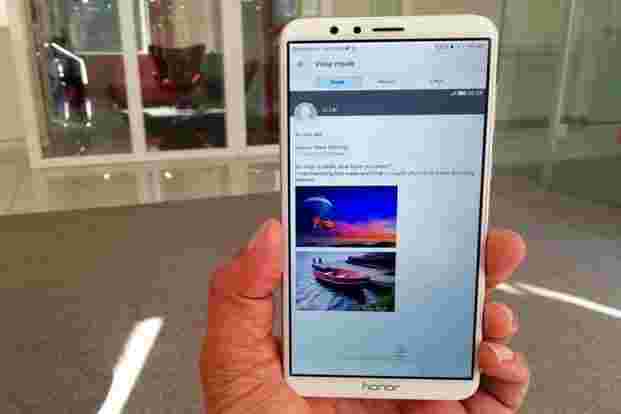 After launching mid-range devices such as Honor 8 Pro and Honor 9i, Chinese phonemaker Huawei is now eying the budget smartphone segment with the new Honor 7x. It is the successor the Honor 6x, which was launched in February 2017. The new smartphone is available on Amazon.in at a starting price of Rs12,999 for the 4GB RAM+32GB storage variant, while the variant with 4GB RAM and 64GB storage will cost Rs15,999. It is competing against Xiaomi Mi Max 2, which starts at Rs13,999. ■ The Honor 7x is a major step up over its predecessor in terms of design. It looks more polished and premium with the metal body, rounded edges, discreet antennas and the thin bezel design. It weighs 165g, which is impressive for a 6-inch screen smartphone. ■ The finger print is placed at the back and is easily accessible. It is fast and can be used as one stop button to capture and browse through photos, answer calls, and even manage notifications. ■The 5.9-inch screen (2,160x1,080 resolution) occupies almost 83% of the front panel, giving it a more edge-to-edge look. This has an 18:9 aspect ratio, which makes it more immersive for video playback and gaming. The only drawback is perhaps the subdued vividness. ■ The smartphone accepts microSD cards of up to 256GB. The only niggle is that the card slot has been clubbed with one of the SIM slots, which means you can’t use both SIM slots and microSD card at the same time. This can be a bit limiting on the 32GB variant. ■The Honor 7x is powered by Huawei’s16nm Kirin 659 octa-core processor, with 4GB RAM. It can handle heavy apps and games such as Shadow Fight 3 without breaking sweat and is at par with the Qualcomm’s 14nm Snapdragon 625 octa-core processor used in the Xiaomi Mi Max 2. ■The smartphone runs last year’s Android 7.0 with a layer of Huawei’s Emotion UI on it. It is a polished looking UI and offers some unique personalisation features too. ■ The key highlight of the Honor 7x is the 16-megapixel and 2-megapixel cameras on the back. The duo combines two images to blur the background and make your portraits look lively. ■ In terms of picture quality, the cameras impress with colour reproduction, even in limited light. Close-ups look impressive, especially photos in bokeh mode. Landscape shots when viewed on large screen look clear and detailed. It struggles when it comes to lighting up objects in darker areas. ■The Honor 7x is one of the best big screen smartphones in the segment. 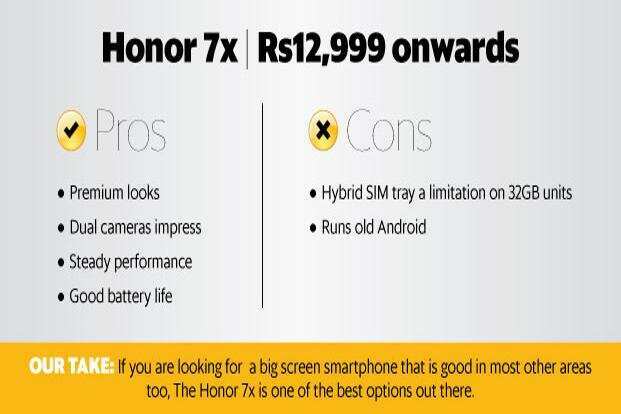 It impresses most with its premium looks, ergonomic design, dual camera, stutter-free performance. But you cannot ignore the Mi Max 2 with its 6.4-inch screen and 5,300mAh battery is a better bet. However, it is bigger in size and can be a bit unmanageable with one hand.